Condo Culture | Condos and apartments: What's the Difference? Condos and apartments: What's the Difference? Happy Friday Everyone! We hope you all had a great week. Do you remember when you were in school and your teacher would say to the class “There is no such thing as a silly question!”. This is one of those situations. 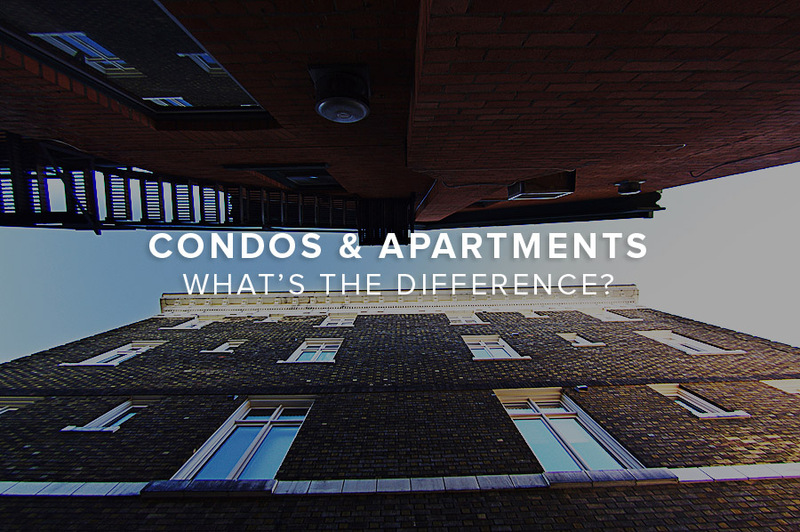 A frequently asked question we often get from those looking to rent a condo locally but many are still too shy to ask is “What is the difference is between a condo and an apartment?”. Although they can look the same on the surface and sometimes their physical appearance, the key difference stems from the type of ownership. For those of you out there not quite ready to buy who are currently in the market to rent a condo (or apartment) it’s important to understand the difference and how this may affect your experience living in the building. So… for those of you just getting into the market or looking to test out condo living, let’s take a closer look. The biggest difference boils down to ownership type. Unlike most condos, apartment buildings are usually owned and maintained by a single entity or corporation and leased out to individual tenants. Condo units on the other hand are owned by individuals. Therefore, when you rent a condo, the condo owner is typically your landlord and your first point of contact unlike an apartment building where you’re often dealing with a larger corporation. The financial costs of renting a condo or apartment can be similar for types and instead, it is usually more a factor of how new the building is, the quality of finish it offers and amenities provided on site. However, given the fact that condos are moreso built for those looking to purchase and move into the suites themselves, condo units will typically come with higher-end appliances and often with more upgrades done to the unit. Renting in a condo usually means interacting with the owner directly as your landlord. The main benefit of having the owner of your unit as your landlord is having the opportunity to build a personal relationship with one another. This can helpful in being able to address requests quicker or getting something fixed but remember not all landlords are created equal. Whether you’re renting a condo or an apartment it’s important to take the opportunity to vet each landlord and get a feel for how quick they’ll be to respond or how easy they’ll be to work with just like they’ll be vetting you when you submit your application. While there are some really great apartment owners out there that come close to rivaling some of the luxury condo buildings locally, more often than not those renting condos typically find condo buildings to exhibit more pride of ownership when it comes to the overall upkeep of the unit and throughout the building. This is largely due to to fact that unlike an apartment building where the entire building is tenanted, you’re often living alongside residents who are owners themselves and tend to carry a high pride of ownership. Each individual has invested their time and money into something that they genuinely care about and this is apparent in most local condo buildings with a strong proponent of owners in the building. Have you spotted the difference or found exceptions to this rule? Reach out to us and let us know. We’d love to hear about your experience and offer ways where we can help. While some of the newer apartment buildings have increased the level of amenities they offer, many apartment complexes still come with the more basic amenities such as: on site vs. ensuite laundry, secure entry, resident lounge and an on-site gym. Condo amenities vary but its common in most urban condos locally to find amenities like: concierge, gym, pools, outdoor terrace areas, party rooms, theatres, and more. Different price tags means different lifestyle perks so while ownership type matters, you’ll find both both condos and apartments range widely in price based on where they’re located and what they offer. So what does this all mean when it comes down to understanding the difference between an apartment and condo? Costs, location and amenities just to name a few. Knowing the difference will ultimately help you make a quick decision. Whether you’re in the market to rent a condo or apartment, comparing the benefits of renting vs. purchasing or just trying to get a handle on the market, make sure you reach out to and expert (aka, us!) and get advice that will help you make the smartest decision for your specific needs and goals.